Many people are aware of what fire sprinkler systems are. 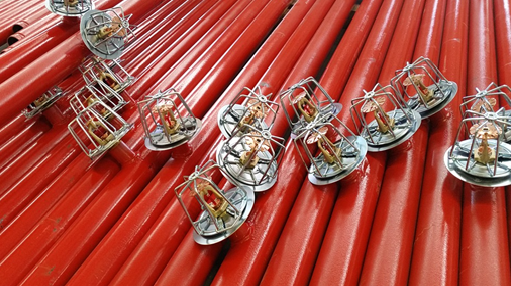 However, most don’t know about the four major types of sprinkler systems, much less the two main types that we can find in businesses and high-end homes: wet and dry fire sprinkler systems. What’s the difference between wet and dry sprinkler systems? And what are the points in favor of each? Wet sprinkler systems use a network of pipes to deliver pressurized water to sprinkler heads. The water is released when the sprinklers are activated, usually when smoke or high heat is detected. Dry sprinkler systems don’t use dry chemicals to stop a fire, though those types of fire suppression systems exist. Instead, “dry” sprinkler systems are either filled with pressurized air or nitrogen that must be discharged before the water will be released. Both types of fire sprinkler systems rely on water to control the fire. You don’t have to worry about complex, toxic waste after the sprinklers turn on and put out the fire. Wet sprinklers work better in fast-moving fires like those in a factory. They offer more protection to both people and property in these cases. Dry sprinkler systems take up to a minute for the water to hit, giving someone time to turn off the sprinklers if the fire alarm was maliciously triggered, or the option of covering sensitive items. Wet sprinkler systems are easier to modify, maintain and change, though you want changes designed and overseen by qualified sprinkler engineers. You cannot risk sprinkler heads in a new extension failing to work because you misestimated the water pressure. Conversely, if there is a water main break or your water is turned off, there is a chance that dry sprinkler systems won’t work at all. The wet sprinkler system still has pressurized water in the system, so it can be distributed regardless of upstream conditions. The dry sprinkler systems require special components and a constant, reliable air supply. This makes them more expensive to install and maintain. Furthermore, it puts limits on the ways you can layout such systems. In short, there are people who can only afford to install a wet sprinkler system if they have one at all. Because wet sprinklers contain water, they’re at risk of freezing when temperatures get below 40°F. If the building freezes, you can’t stop a fire that breaks out. Dry sprinkler systems are the only option in places where the pipes may freeze or regularly do. This is why they’re commonly installed in parking garages, warehouses that aren’t climate controlled, and walk in refrigerators. Sometimes the things we want to protect from fire need to be protected from moisture, as well. This means that wet sprinkler systems should not be used to protect computer rooms, warehouses full of electronics and anything else ruined by an unnecessary deluge of water. Dry sprinkler systems allow you to gain this protection while minimizing the risk of property damage. All sprinkler systems provide a measure of protection in case of a fire. Which type of sprinkler system works best for you depends on what you’re trying to protect beyond the occupants of your building.